Bulldog’s number one rule is hope for the best, plan for the worst, and with your face it’s all in the planning. 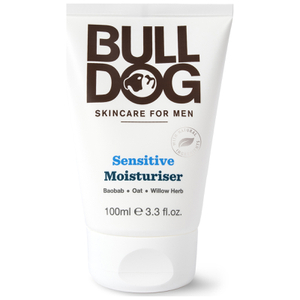 Bulldog Natural Skincare Original Moisturiser takes men’s grooming to a new level of excellence by improving the outlook of your skin. 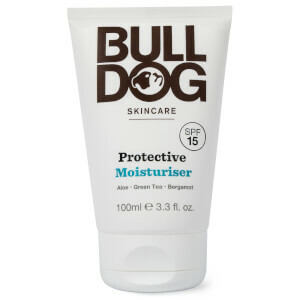 Packed with 8 essential oils of green tea, green algae, konjac mannan and vitamin E to help rehydrate the skin, Bulldog Natural Skincare Original Moisturiser is a daily essential that quenches your skin with moisture after washing or shaving. 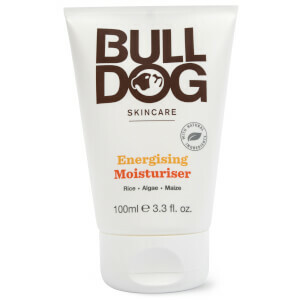 As with all Bulldog products, I'm extremely satisfied with this moisturiser, it smells great and feels refreshing. Girl, try this one yourself! this is a beautiful moisturiser for combo skin types and especially for the price. I love that the ingredients are all natural. Absorbs instantly and layers really well with other products both under and over and never causes any pilling. Has a slight 'masculine' fragrance but nothing aggressive or offensive like most products made for men and disappears fairly quickly. Great for saving space when we travel because me and my boyfriend both love it. Highly recommend ladies give it a go! The title says it all. I used to buy this on Amazon but they no longer offer the same deal so it was great to find it here. Very happy all-round. Will definitely use Lookfantastic again! I've been using this Bulldog moisturiser for about 6 months. It's the best face cream I've ever used and I've tried a lot of creams! It's light so I can wear it under make up and smells lovely! I also love the fact the company doesn't test on animals too! My skin is glowing and soft  Would recommend to men and women. My husband like it very much and it is the second time I brought it for him. It is Moisture and the skin feels fresh. Very nice fragrance, leaves the skin clean and fresh. I can only recommend. I have been using this product for two years now and it made my skin look better than ever! I used to have bad skin but this combined with face wash make my skin refreshed and moisturized for everyday challenges. Get this product and feel great everyday. My boyfriend is absolutely in love with this product, ordered it for the second time! Perfectly moisturises dry skin! Skin doesn't give off that oily shine but rather, a matte look after applying. Absorb really fast into the skin and does not feel sticky too. Definitely will repurchase again once I finish this current tub.